The electoral implications of the impending retirement of Senator Ben Nelson of Nebraska are fairly obvious. This is bad news for Democrats, who were already going to have a difficult time holding on to their narrow 53-47 advantage in the upper chamber. It’s not as bad for them as something like the retirement of Senator Kent Conrad of North Dakota, which took a seat that Democrats were likely to retain and turned it into a likely gain for Republicans. Rather, with middling approval ratings in a red state in an anti-incumbent climate, Mr. Nelson’s re-election prospects were tenuous to begin with. If Democrats can get former Senator Bob Kerrey of Nebraska to run in Mr. Nelson’s place, their odds of retaining the seat will not necessarily be worse than they would have been with Mr. Nelson. Nevertheless, Mr. Kerrey is not assured of running, and Democrats have a very thin bench in the state. Without a strong recruit, this could be a seat that effectively winds up in the G.O.P. column long before the voting actually begins. It’s worth considering Nebraska in the context of the broader Senate picture. Our objective technique for forecasting Senate races is not designed to be applied until summer of the election year. (Before then, the polling is a little too rough, and there is too much uncertainty about the identity of nominees, for polling-based forecasts to be of all that much value.) So you will have to wait on those. However, I have traditionally issued subjective estimates of the probability of the parties winning each seat in advance of our objective numbers. Basically, I’m looking at the same thing that other forecasters do: approval ratings, recent electoral history, candidate quality and so forth — and yes, I do look a little bit at head-to-head polls, especially if both candidates are well known. I also tend to place more emphasis than most forecasters on the overall partisan makeup of a state. For instance, although Senator Joe Manchin III of West Virginia has quite strong approval ratings for the time being, I’m not comfortable classifying the race as completely safe for Democrats given that Barack Obama will be on the ballot and is very unpopular in West Virginia. Mr. Nelson is one of several examples of senators who were once very popular but who were brought down to earth by partisan gravity. Conversely, although some polls suggest that Hawaii could be competitive, where Senator Daniel K. Akaka is retiring and former Gov. Linda Lingle is the likely Republican nominee, I’m not comfortable classifying it as a “toss-up” when Mr. Obama is extremely popular there and will probably win 70 percent of the vote in November 2012, bringing substantial Democratic coattails with him. Otherwise, my estimates are pretty close to the consensus. 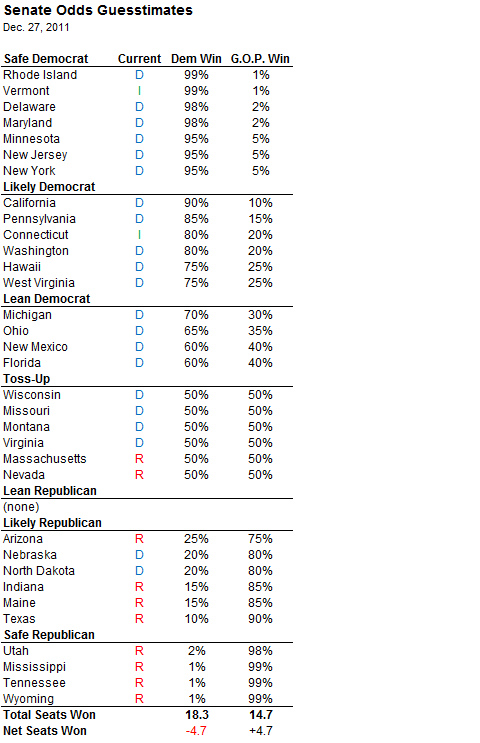 The difference is that I go through the pretense of attaching a probability estimate to each race in addition to placing them in categories like “lean Republican” and “likely Democrat.” My estimates of the odds for all 33 Senate races are below. The apparent good news for Democrats is that they are likely to win the majority of Senate races next year. If you sum up the percentage forecasts across all 33 races, it comes out to 18 or 19 wins for Democrats, versus 14 or 15 for Republicans. The problem, of course, is that that Democrats were already in possession of 23 of the 33 seats. If they retained just 18 or 19, they would lose a net of 4 or 5 seats to Republicans — enough to cost them control of the chamber. Thus, I concur with the conventional wisdom that Republicans are favorites to win control of the Senate next year. What’s more difficult to do with an informal technique like this one is to estimate how heavily Republicans are favored. There’s a big difference between being a 90 percent favorite and a 55 percent favorite. My impression is that people tend to under-appreciate the degree to which the outcomes in different Senate races are correlated. If the political environment is strong overall for the Democrats next November, they could win all or almost all of the competitive races. Conversely, they could lose all or almost all of them if the political winds are blowing in a Republican direction. Because an unusually large number of Senate races are competitive this cycle, that yields a very wide range of potential outcomes. For instance, if Republicans were to win all of the races that I classify as “lean” or “toss-up,” they would win a net of 10 seats from Democrats — which would put them within striking distance of building a filibuster-proof majority, which would require a net gain of 13 seats. Win a few of the “likely Democrat” seats like Washington and Pennsylvania, and Republicans could actually achieve that goal. Conversely, if Democrats were to win all of the “lean” and “toss-up” races, they would lose no seats at all. In fact, they could add to their 53-seat majority if they managed to salvage a seat like North Dakota or Nebraska (both of which I classify as “likely Republican”), or pull off a modest upset in Arizona, where Senator Jon Kyl, a Republican, is retiring and some polls have shown a competitive race. Thus, a realistic forecast of the Senate is that Republicans will pick up four or five seats — just enough to guarantee them the majority whether or not Barack Obama is re-elected and Vice President Biden controls the tie-breaking vote. But the forecast has a very large margin of error. Republicans could plausibly pick up 13 seats, or lose 2. The larger the margin of error in a forecast, the less meaningful it is to have a small lead. Because primary polls are associated with much larger margins of error than general election polls, for instance, having a five-point lead in advance of the New Hampshire primary is quite tenuous, while the same polling margin in advance of a general election is fairly solid. Thus, I don’t know that Republicans are particularly heavy favorites to win the Senate; their situation is analogous to having a small polling lead in advance of the New Hampshire primary. Perhaps they are something like 60-40 favorites. But if Republicans do win the Senate, they could do so in spectacular fashion. There are Democratic seats available in every corner of the country, very few of which are truly safe, creating the potential for a double-digit gain. If Republicans are having a night like that, Nebraska should be one of their easiest pick-ups. An earlier version of this post misspelled the name of the former governor of Hawaii.